World 6-1 is the first level of World 6 in Super Mario 3D Land. The level is a tropical themed level, featuring Cheep Cheeps. Mario starts on a circular flowery land area, surrounded by stones and a fence. On the right side, he will cross a bridge where a coin ? Block, leaping Cheep Cheeps, a Porcupuffer and a Roulette Block are found. The bridge ends a little before a grassy stone top be found, and another bridge is found after it. In it, Mario face three Tail Goombas. More grassy stones and bridges must be crossed, with more leaping Cheep Cheeps and Biddybuds. Then, Mario encounters an island, with a ? Block and a rope. 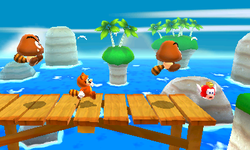 When Mario walks on this rope, a Porcupuffer will jump of a waterfall in order to hurt Mario. The tightrope ends at a bigger island, where the plumber can activate the level's Checkpoint Flag, use a pair of Binoculars and enter a Warp Pipe, that leads to a bonus underwater place with a Red Ring, a yellow ring, a Star Medal, Cheep Cheeps and Bloopers. Mario can use this area or a tightrope to reach another island with two ? Blocks and tree Brick Blocks. After crossing a small bridge, he must go on another tightrope attacked by leaping Cheep Cheeps. One last bridge is encountered, that is attacked and broken by Porcupuffers. This bridge leads to the last island of the level, where the Goal Pole and one last Porcupuffer attack resides. Star Medal 1: At the beginning of the level, the player should jump behind the rocks to reveal a hidden Star Medal. Star Medal 2: To the right of the checkpoint is a Warp Pipe. Taking the pipe will transport the player to an underwater portion of the level. The Star Medal is found at the top at the end of the area. Star Medal 3: After the checkpoint, the player should come across a Flying ? Block while walking along a tightrope. They should hop atop the block and jump onto a tightrope directly above, where the final medal lies.